Michael Sampson--Taylor Siemens throws heat at opposing batters this season. The California Baptist University baseball team is off to a good start, with an exciting 19-2 record for the 2011 season. Taylor Siemens, a senior accounting major, is the starting pitcher for the Lancers and has been on the team since his freshman year in 2008. Siemens attended La Mirada High School, where he played three varsity seasons of baseball and basketball. When beginning his career at CBU, he was forced to redshirt due to a previous surgery. In 2009, he made an incredible turn around and made 13 appearances, starting in 12 games as a redshirt freshman. 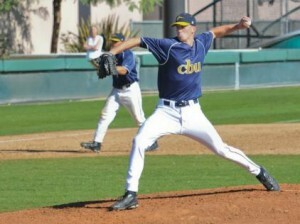 In 2010, his second season at CBU, Siemens was named All GSAC First Team. He went 11-1 with a 2.62 ERA. He was also ranked No. 4 in the National Association of Intercollegiate Athletics innings pitched (113.1) and No. 15 in wins (11). He ended the season with two consecutive complete game wins in the first round of the NAIA World Series. “My goal for the 2011 season, individually, is to pitch the best of my ability and, as a team, it is to win in the College World Series,” Siemens said. Siemens continuously strives to be at his best to help the team and to pitch as well as he can so that he is able to motivate the team and help his defense. Competitive edge is huge in the game of baseball and it’s something that he loves the most. “Competition is something that really makes the game enjoyable because it’s exciting to see how I match up to the other players that I am up against in order to see how I am doing individually,” Siemens said. Working to improve their craft is another thing that each athlete must look at in order to better themselves and to keep up with competition. One thing he hopes to improve this season is his individual repertoire of off-speed pitches but mostly he is concerned with being mentally focused at all times so that he can put forth 100 percent effort in every game and practice. Siemen’s loves the game of baseball and is determined to finish his senior season at CBU on a good note. His hopes to reach the College World Series will be in good shape if he and the team continue their hard work and diligent training.